PALM SPRINGS – Construction is progressing at the future home of OffLeaseOnly Palm Beach. Watch us GROW! 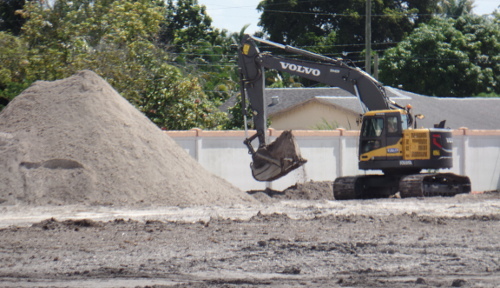 Heavy equipment operators are moving dirt, digging trenches and compacting soil at the sprawling 14.23-acre site at 1200 S. Congress Avenue where a new used car dealership will soon rise from the ground. OffLeaseOnly has outgrown its current home at 3531 Lake Worth Road and the long-awaited used car store is much anticipated. 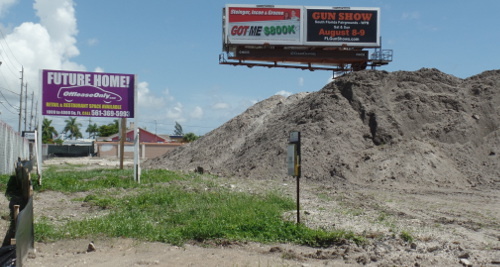 OffLeaseOnly sign stands next to gigantic dirt piles at future home of OffLeaseOnly Palm Beach at 1200 S. Congress. Construction is expected to take at least a year. 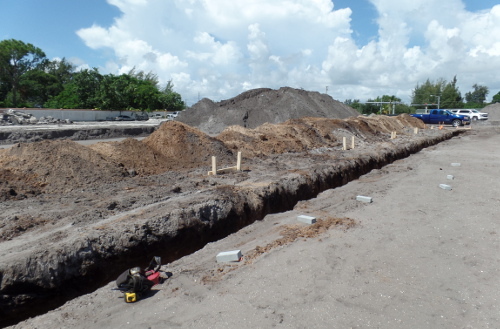 Work crews have cleared and leveled the site, scooped excess fill into mountainous piles, hauled off broken cement and dug precise trenches for the new building’s footings. Construction crews are expected to begin pouring concrete this week for the used car store’s foundation and then begin constructing the structure’s concrete block walls. The process is time consuming because soil tests have to be taken along the way to make sure the ground is properly compacted to ensure stability. Still, passersby should see the beginnings of OffLeaseOnly Palm Beach’s new building beginning to rise sometime this week, Filkowski said. The 42,152-square-foot used car dealership will be situated on the east side of Congress Avenue. An excavator digs trenches so the walls of the new OffLeaseOnly Palm Beach dealership can be built. The project includes a two-story, 21,592-square-foot office building adjacent to a 21,000-square-foot maintenance garage. The site plan includes a 2,000-square-foot restaurant and 6,000 square feet of retail space. 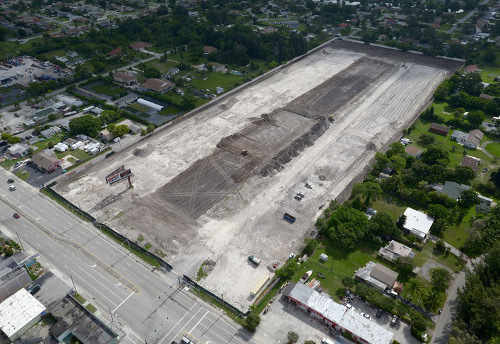 Future site of OffLeaseOnly Palm Beach at 1200 S. Congress Ave.
OffLeaseOnly operates used car dealerships in Palm Beach, Miami, Orlando and West Palm Beach and more stores are planned for Tampa and North Lauderdale. 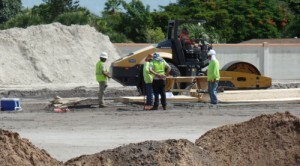 The Congress Corridor where the OffLeaseOnly Palm Beach store is being constructed is a key area of concern when it comes to economic redevelopment. The huge new used car dealership is expected to positively impact the surrounding areas, spurring economic growth. Trenches dug by construction workers so walls can be built. 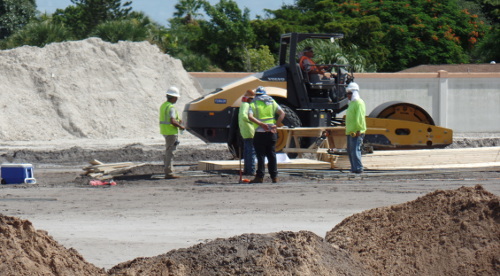 Construction workers discuss progress at OffLeaseOnly Palm Beach construction site at 1200 S. Congress. The gigantic used car dealer is known for its policies of no haggling, no hidden fees and an all around pressure-free sales experience in addition of course to its rock bottom prices. Used car buyers receive complimentary Carfax reports on every vehicle and can even take their vehicle of choice to a mechanic prior to purchase. Customers are also encouraged to test drive their vehicles without having to take an OffLeaseOnly employee along for the ride. OffLeaseOnly wants customers to be able to focus on what’s important to them and not be swayed by a salesperson’s point of view. Off Lease Only inventory is loaded with thousands of cars all priced thousands below retail. Used car buyers who need a quality used car can find the car of their dreams by simply logging on to www.offleaseonly.com and sorting the used cars by make and model. Shopping for a used car has never been easier! Whether you are shopping on a budget or are ready to get that luxury car you’ve always wanted, OffLeaseOnly has the best selection of quality used cars for sale anywhere. With over 100,000 happy customers Off Lease Only is The Nation’s Used Car Destination! Don’t take it from us, read our customer reviews on the OffLeaseOnly Reviews Site! The OffLeaseOnly review site aggregates reviews from Yelp, Google, Edmunds, Cars.com, DealerRater and Better Business Bureau in one convenient location. Stop by one of Off Lease Only’s four locations in Palm Beach, Miami and Orlando to check out our incredible used car inventory of more than 3,000 quality, low-mileage used cars for sale! Then drive home the perfect pre-owned car at the perfect price.